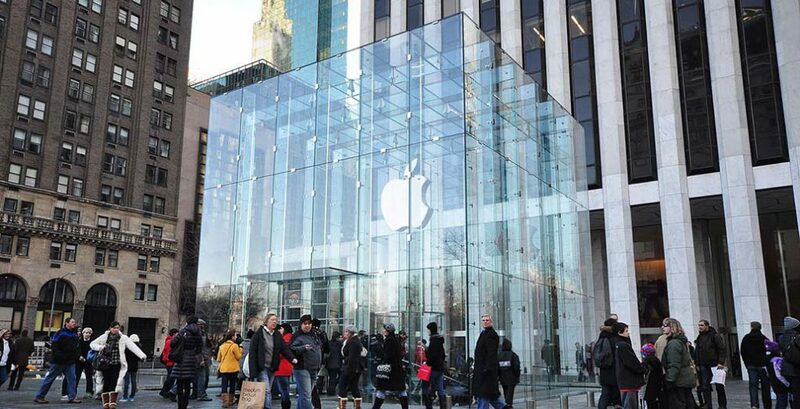 Apple's store on Fifth Avenue in Manhattan, New York. The decision to plonk a flagship Apple store in the middle of Melbourne’s premier civic space, Federation Square, is part of a wider global trend of big business co-opting public realm to build brand cachet. Nearly 500 people lined up on the morning of May 19, 2001 in an upscale shopping centre in McLean, Virginia – a town just over the river from Washington DC. Some of them had even driven up especially, intent on being the inaugural visitors to Apple’s first retail store, which had only been announced by the company four days earlier. The space – which measured over 4500 square feet – was described as “spotless [and] well-lit”, using materials such as light wood, brushed steel and white glass to elevate the company’s colorful see-through iMacs and Power Macs. Steve Jobs, the late chairman, CEO and co-founder of Apple Inc., aired a pre-launch video at MacWorld New York to introduce the store – this, at a time when only seven percent of internet users worldwide had broadband internet, would have made watching the video online near-impossible. By 2017, Apple operated over 492 stores across 19 different countries; 2018 saw the company hit the magic 500. Now, the multinational tech company has set its sights on Melbourne. While the city boasts five official Apple stores and myriad Apple-affiliates, this new store will be the “flagship”, sitting within Melbourne’s award-winning civic space, Federation Square. A narrative of prestige and exclusivity sets this store apart from its regular counterparts: Foster + Partners are responsible for the design, Apple labels it as its “most significant store in the Southern Hemisphere”, and when complete, it’ll be one of only five flagship stores in the world. Fervent debate has followed the announcement, significantly driven by Citizens for Melbourne’s ‘Our City, Our Square’ campaign. To make room for the store, the river-fronted Yarra Building will be demolished. 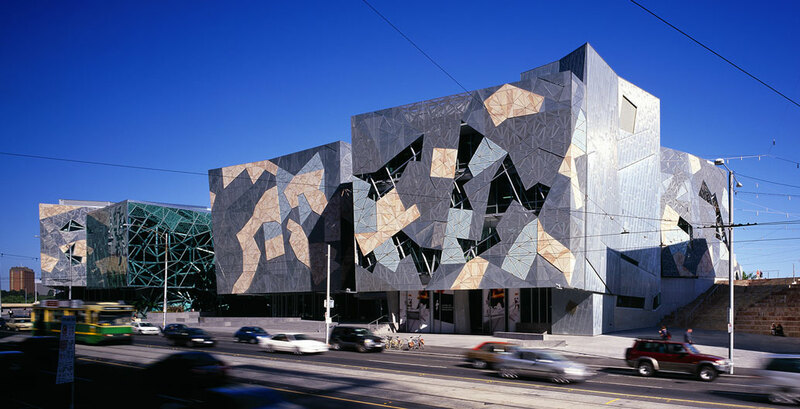 The building is currently home to the Koorie Heritage Trust, whose Board of Management “made the decision to capitalize on a rare opportunity to relocate the Trust to larger premises”, but expect Koorie Heritage Trust will still remain “a crucial element of Federation Square’s cultural and creative tenancy.” Melburnians of all stripes have chimed in, while the Office of the Victorian Government Architect and Federation Square’s co-architect, Donald Bates, have come out in support of the move. 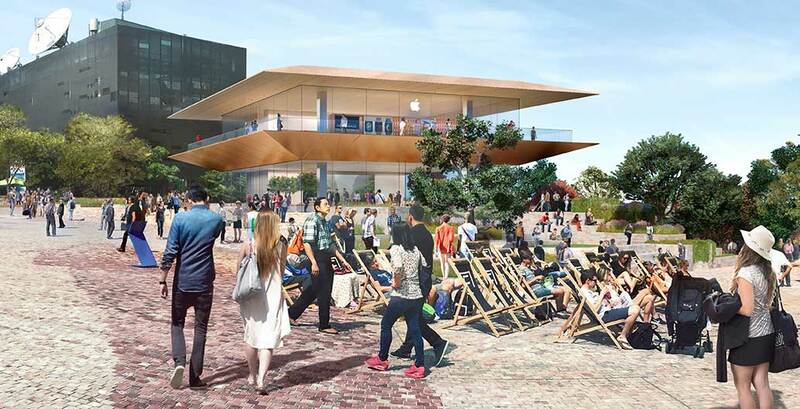 The Victorian Government has announced plans to demolish Federation Square's Yarra Building for an Apple store. Canniford goes on to explain that when Apple first established itself in the market, the brand seemed to promise its customers cultural capital and social mobility as a result of purchasing its products. Now, it seems Apple seeks to gain a similar kind of cultural capital from a geographical location that promises an “educated, interested, vibrant, activated” population that will be constantly moving through it (and thus exposed to Apple’s product offerings). “Operating without substantial ongoing government support, Fed Square struggles to maintain its heavily utilized buildings and public spaces, while honouring its public charter. A major corporate tenant such as Apple will go a long way to re-balancing the operational impost on Fed Square”. 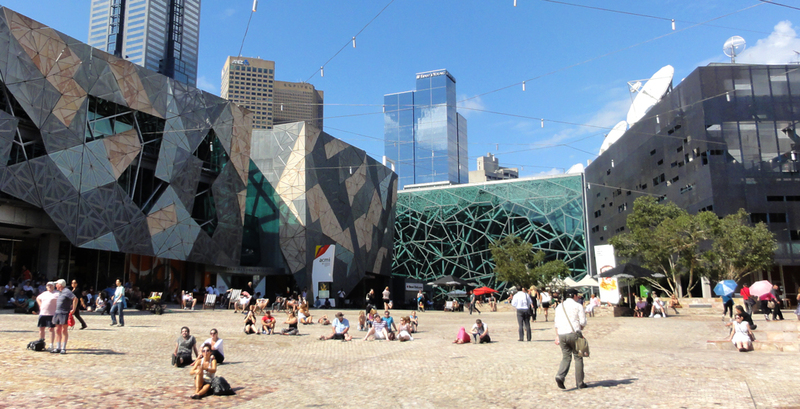 Corporate advances into Federation Square aren’t a new phenomenon. In fact, the tech company’s direct competitor, Samsung, set up a quasi-exhibition-slash-installation in the square in September 2017 titled the ‘KIIS 101.1 Cube’. A partnership between Samsung, the Australian Radio Network (ARN) and local radio station, KIIS 101.1, it was designed to promote the new Samsung Galaxy Note8. Here, the reflective black surface of the Cube and strategic positioning turned it into a new focal point of the Square, as people queued to get inside. Once inside, customers would be led to the Samsung Galaxy Studio where they could participate in a range of interactive experiences involving virtual reality and screen-based technology. Donald McNeill, Professor of Urban and Cultural Geography at Western Sydney University, cites Federation Square, as well as the heritage-listed Customs House Square in Sydney, as sites where marketing activations or pavilion-style experiences happen within or around it. While he’s not opposed to commercial tenancies that serve their most basic purpose (‘to sell things’), his concerns lie with what happens when brands begin co-opting the cultural capital that many public spaces inevitably carry with them. Federation Square has argued that they have not earned a profit in over 15 years, with a reported AUD$32.62 million in losses over the past five years. The Square relies on commercial tenancies and services like its car park to pay for upkeep and to put funding back into community projects. As determined by the Victorian Government and the City of Melbourne, Federation Square’s Civic and Cultural Charter outlines that the Square has to be able to provide “an identifiable synergy between the cultural program and other leisure, personal and commercial services”. In 1999, author and social activist Naomi Klein published a book called No Logo on the insidious effects of corporate marketing. She hoped that as more people “discover[ed] the brand-name secrets of the global logo web, [our] outrage [would] fuel the next big political movement, a vast wave of opposition squarely targeting transnational corporations, particularly those with very high name-brand recognition.” In the book, she also made reference to a visceral feeling – a “bad mood rising” – that was caused both by a growing public awareness of corporate hijacking of political power, and brands’ cultural looting of public and mental space. While attempts to block the Apple Store in the Victorian parliament have failed, it’s unclear how – or, if – citizens can protect public space when their elected representatives set precedents of giving public space to multinationals in secretive deals that don’t consult with the general public who use it. As the lines blur between what differentiates a city from a brand campaign, protesting or avoiding these new additions to urban form becomes more difficult. 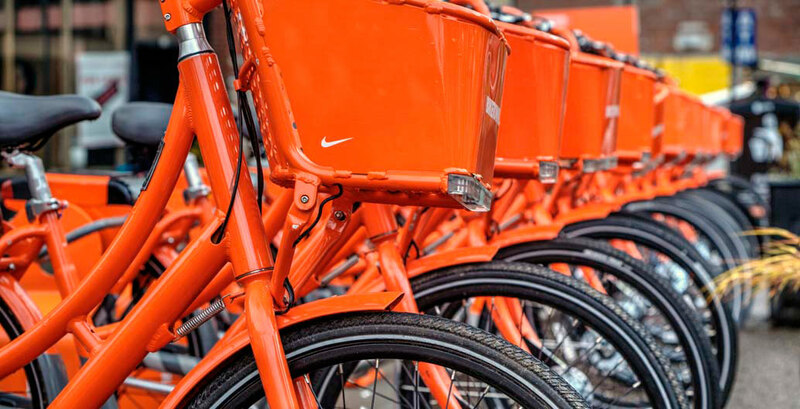 The term ‘brand urbanism’ – a strategy where brands use public sites in exchange for visibility and offer funding to a city; often substituting more traditional forms of advertising – has been used to describe a new form of marketing, where cities become the billboard. One of the key advantages for the brand here lies in the potential to communicate their values on a bigger canvas than traditional media channels might offer. Local governments often view this as a new source of funding, and a potential way to improve urban amenity. 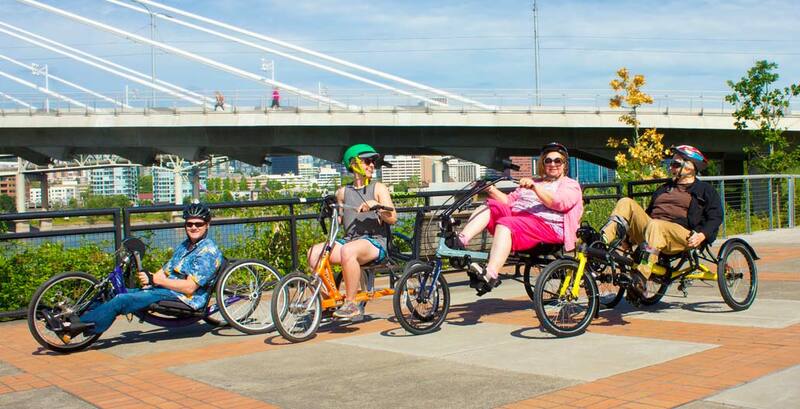 Recent examples include BIKETOWN, a collaboration between the City of Portland and Nike; Emirates Air Line, a cable car link that runs across the Thames River – a collaboration between Emirates (who partly funded the project and earned naming rights) and the City of London; and chemicals company AkzoNobel/Dulux who partnered with the City of Charleroi, voted Belgium’s ugliest city, to paint the town in rainbow colours. According to research conducted by Berlin-based brand strategist Lisa Sibbing, we are currently steering away from a ‘brand as media’ logic towards a ‘brand as enabler’ logic. 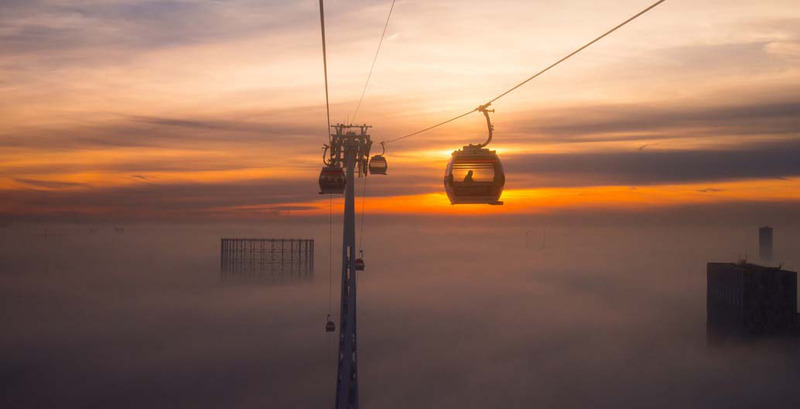 This new marketing sensibility sees the consumer as a co-creator of the brand – prioritising spontaneous intersections where human experience is considered the medium, not just the outcome of a campaign. In this situation, the brand becomes an ‘enabler’. Sibbing also cites São Paulo’s Clean City Law as an example of how public legislation can save a city’s civic spaces from advertisers taking over them. Although “[São Paulo] went through something of an identity crisis after the first ads came down” (over 15,000 billboards and 300,000 oversized storefront signs were removed in one year), taking down the advertisements ultimately “made space for the ‘real’ identity of the city”: including exposing the favelas and shanty towns that were previously hidden behind huge billboards. When Dr Sarah Barns, a Research Fellow based at the Institute for Culture and Society at Western Sydney University, is asked what public citizens might lose when an external company takes over a familiar public space, she points out that “the spaces that haven’t been intervened with, or activated, or helped to realise their greatest commercial potential are often the most interesting spaces” and tend to get “left behind”. For any city, a clear identity – be that through its logo, its ‘Big Things’ or its architecture – helps create positive, distinctive associations for people. At best, those visual cues can act as a trigger to a set of emotions or ideas that bind people together. At worst, that sense of identity may be co-opted by a multinational’s brand identity. Wouters, Barnes, McNeil and Canniford all agree that urban design is becoming less and less concerned with public involvement in decision-making, coupled with a diminished focus on giving back to the public and, ultimately, trying to produce a better society. As Nikos Papastergiadis, Director of the Research Unit in Public Cultures at The University of Melbourne recently commented on the recent changes in Melbourne: “at best, we respond most clearly [as a society] when we are defending public space, and at worst…we…never really learnt how to speak with a public spirit”. Apple representatives were contacted for comment but did not share any comments on record. Nathania Gilson is a writer, editor and multimedia producer. Her writing has been published by Kill Your Darlings, The Lifted Brow, Meanjin, and Writers Bloc, among other places.